You may have been reading a lot in the media lately about the dangers of covering your strollers and prams. Is there enough air flow? Is it getting too hot? 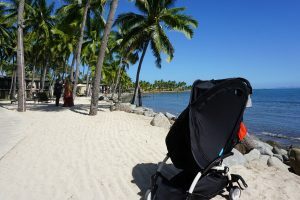 Every year, the media digs out an article written by Swedish Paediatrician Svante Nogren, warning parents not to cover their prams with even the thinnest of muslin cloths claiming that heat gets trapped inside the stroller and doesn’t keep baby comfortable or safe. Here at CoziGo, we want to educate parents rather than scaremonger. It’s true not all stroller covers are created equal and the habit of reaching for whatever is at hand to cover your baby at sleep time or when it’s sunny really needs to stop. The KEY word you need to remember is Air Permeable, not breathable! Most fabrics when you put them up against your face will allow you to breathe through them…. But the issue is making sure that air is freely flowing through whatever you place over your stroller. The creator of CoziGo used to use muslin wraps and light blankets to cover her baby’s stroller, but always found an excessively sweaty baby waking up from her slumber. She decided she wanted something better for her second child and set about designing CoziGo. 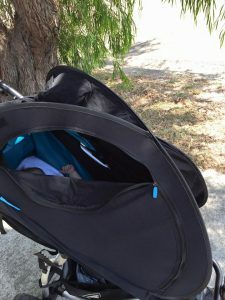 She specifically designed it in the unique dome shape to allow plenty of kick space for baby to get comfortable, but the dome also maximises the amount of airflow that circulates around the stroller. The fabric was researched heavily and has been tested for breathability and permeability. Remember, air permeability is the important reference point here. CoziGo is 100% air permeable and breathable. This means that when the cover is over the stroller, the temperature inside the stroller rises no more than when it wasn’t there! Why’s it black? To block light – it’s still breathable and air permeable. CoziGo blocks 97% of light enabling your baby to drop off to sleep without distraction. Does is protect from the sun? Yes, CoziGo offers 50+UVP protecting from the sun’s harmful UV rays. The multiple two-way zippers allows you to open the sides allowing baby to interact with the world without looking through fabric and remaining safely shaded from the sun. Don’t take the risk! When you’re investing hundreds of dollars in to you pram, invest in the best stroller cover money can buy. 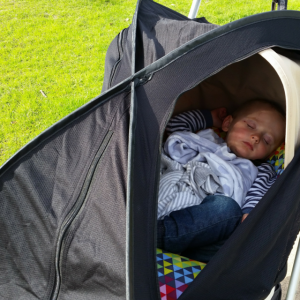 CoziGo will keep your baby safe at sleep time and when out and about in the sun. Visit our website to find out what else you can use this multi-purpose product for! 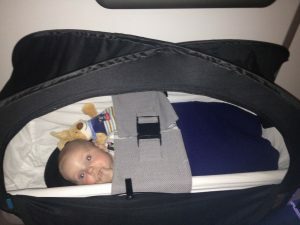 The same product can be used on airline bassinets to make travelling with a baby even easer, but that story is for another day. Buy your CoziGo here, or visit our website to find out what else you can use this multi-purpose product for! The same product can be used on airline bassinets to make travelling with a baby even easier, but that is a story for another day! For our own Caroline’s Angels families, add in the code word SLEEPANGEL at the checkout to get your discount!